The Sons of Scotland are taking a historic trip to France from June 1 to 9, 2019, to play at many venues. We invite you to follow along on their social media channels to see their work. Here is our great itinerary! Arrive in Paris, June 2. Drive onto the Cabaret Rouge Cemetery in Souchez where the PM will play a tune written for the soldier in the Tomb of Unknown Soldier in Ottawa, who is from this cemetery. We will take our letters and cards to his grave, and then later on they will be delivered to the family at Canadian House at Juno Beach. From Cabaret Rouge, we head over to the Vimy Monument and take a tour of the museum, trenches and subway before heading to the Monument to pay our respects and play a tune. We then head onto our first town, which is Ypres in Belgium. We will go along and watch the Last Post Ceremony at 8 pm and enjoy dinner in the town. June 4 will see us head to Dieppe and play at the beach, at the Hautot Sur-Mer Cemetery and lay poppies at all the 948 graves there. Our friend Alan Toull and his colleagues take great care of the Canadian pipers buried there. ​June 5 is the first of 2 beach day performances, with a turn at both the beach and local monument/museum starting at Utah Beach, then onto Omaha and then Gold Beach. 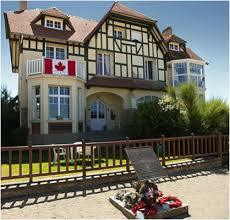 ​June 6 is Juno Beach and Sword Beach performance days, and more information on these shows are to come. June 7 and 8 are free days off in Paris to enjoy the city, and then we head home. ​We welcome you to follow us on Facebook and Twitter, and enjoy this historic trip along with us.